"Enormously fun ... This is a standout in the field of spy nonfiction. Fans of The Godfather movies and of spy novels in general will love how Maier portrays the ties between Sinatra and Giancana, the lush mobster weddings, and the intricate web of deception that drew so many, including Marilyn Monroe, into the mix. Maier succeeds brilliantly here in bringing this outrageous, long-hidden (if rumored) bit of history to vivid and fact-supported life." -- Booklist (starred review). This is a standout in the field of spy nonfiction. Maier, a Newsday investigative journalist for 30 years, uses a slew of documents (including the National Archives’ recently declassified files about the Kennedy assassination, along with sworn court testimony, congressional hearings, and CIA and FBI documents) to make what is a totally credible case that two gangsters worked with the CIA in the early 1960s to try to assassinate Fidel Castro. 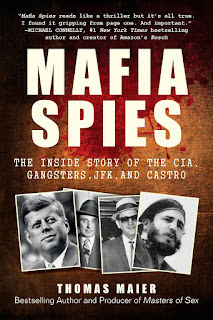 Not only does Maier give beyond-solid evidence for the strange alliance of politicians, mobsters, movie stars, entertainers, and Cuban-exile commandos in Miami seeking to bring down Castro, he also makes the whole book crystal clear (a rarity in spy nonfiction) and enormously fun. The focus is on Hollywood/Las Vegas gangster Johnny Roselli and Chicago Mob boss Sam Giancana, longtime friends made spies by the CIA. Fans of The Godfather movies and of spy novels in general will love how Maier portrays the ties between Sinatra and Giancana, the lush mobster weddings, and the intricate web of deception that drew so many, including Marilyn Monroe, into the mix. Maier includes fascinating details, like plans for exploding cigars, poisons, and drive-by shootings from speedboats. Nothing was off-limits when it came to this CIA-mobster plot. Maier succeeds brilliantly here in bringing this outrageous, long-hidden (if rumored) bit of history to vivid and fact-supported life.